While our overall week has an 'idea' or overall plan, I think that many of you would be surprised to actually be in our house and see how that week actually plays out. There are times that I have great ideas and plans and things don't work and go along with my plans. At all. And you know what? That is fine! This last week I have one picture of Kaleb playing and in all honesty there was little more done that I would qualify as focused time on him. One. No pictures of the endless time pushing him on the swing. Reading the same books over and over again. So while there may not be much to check off on my 'list' I'm really okay with that. Really. I think these are the best kind of weeks! 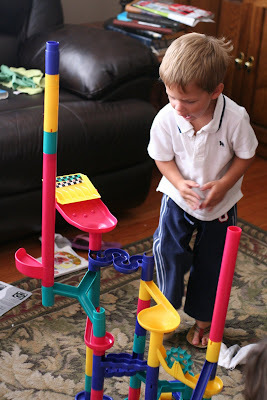 So, is that yet another marble run? I have got to get one of those things:-)!! Those are the moments you'll remember most! I am so loving this Tot School post, just because we don't all have the pictures showing our tot's working on their abc's and 123's doesn't mean that we aren't all spending wonderful quality time with them. Love it! Play is as much apart of learning as anything else we can do with our children. Oh yes how I remember reading the same books over and over again...so many times I still have some almost memorized. We all do have those kinds of weeks! Glad you're okay with it because we are too! Thanks for all your helpful ideas and printouts. Your workbox numbers helped me get everything going. Flexibility can turn a good week into a great one. Sounds like yours was great! I'm sure all those unplanned, no picture moments were as special if not more than the planned stuff!!! Children learn more than we know from play and repitition! I love this post - it reminds me that the simple unstructured "hanging out" time is just as important and needed for our children as any kind of "learning activities". Thanks for this - I need to get out of my "trying to do more" mindset! We had a week like this too. I should have posted about it, but I didn't even take one picture.